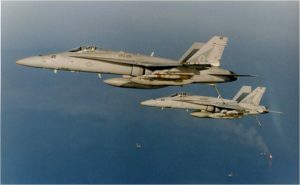 This photograph, that I took 20 years ago over the North Arabian Gulf, is still a common sight. Those F/A-18C Hornets are still flown today and with similar weapons on the wings, and that Iranian oil-rig flare-stack down there is probably still burning as bright as it did in the 90’s when it served as a landmark for us. There is an American aircraft carrier nearby, such as there has been in the Gulf for almost every day of the past 20 years, and seven years before that. I am not acquainted with Harlan Ullman, the author of the recently-released Anatomy of Failure: Why America Loses Every War it Starts, but was aware of him through his writings and guest appearances on cable news and CSPAN before I picked up his thought-provoking book. He is a naval officer by trade, a combat-experienced Vietnam swift-boat commander who went on to serve in “The Building” and defense think-tanks. He is a product of the Washington defense establishment, and is a sought-after commentator on defense issues. He has quite the pol-mil pedigree, and comes across as a serious guy who is speaks truth to power. At its core, Anatomy is a study of the presidential administrations and the conflicts each has presided over since and including Vietnam. Though Ullman touches on the post-WWII world order, he cites military actions the United States has engaged in since he came of age in the 1960’s. It is not a record of success. While military men and women are justifiably proud of their service in combat, it is Washington, and primarily the White House, that almost every time manages to lose the peace. So then, why are we still patrolling the Arabian Gulf, and with airplanes and weapons that are 20-years old and older? Why is our annual defense budget some $700 billion with a new-normal of behind-schedule and over-budget acquisition programs? Why? Ullman’s primary causal factor is that the occupants of the White House, even ones with résumés that say otherwise, are not well-versed (or just versed) in the realities of geopolitics. Unwilling to learn – they are already the Commander-in-Chief so why should they? – a succession of presidents and administrations, congresses, defense departments, diplomats and even uniformed commanders make blunder after blunder with lasting consequences in their wake. Groupthink takes hold, and I am reminded of my time in Washington after 9-11. By early 2002, going to war in Iraq to finish the job – regime change – was next; it was in the air. Look at the above photo; I knew the situation better than most citizens, had a sense of the risks involved, and supported the effort to change Iraqi governments. Ullman did not, and calls 2003 a catastrophe of the highest order. I would point to 2011 and the unilateral pull-out – abandonment – of Iraq on an artificial timeline, but serious political and diplomatic mistakes were made in 2003 and 2004 that made the situation much worse. Reasonable – and informed – citizens can disagree. This brings us back to Ullman’s first point. To have these educated conversations and debates, one must be educated. Short of sending every American to War College for an advanced degree in National Security Policy and Strategic Studies, self-study through reading is the answer. Ullman’s book is not tearing up the charts on Kindle. While it is well-written and thorough, it, like most pol-mil literature, is dry and frankly over the heads of most Americans; not you, Dear Reader, but most and particularly our young Americans. If you admit to liking War College reading assignments (okay, okay, I read most of books assigned, but late at night…after the kids were asleep!) you’ll enjoy Ullman’s book. Alas, most of our citizenry has never heard of it and would not even crack it open were it handed to them. That’s fine…except every 2-4 years those same citizens wield a very powerful weapon – a vote. If non-fiction books like Ullman’s are not going to be read by even a fraction of 1% of our population…how do we expect our population to know anything about the current challenges we face? We learn through stories. Movies are the easiest way, just sit back and watch, but even movies about real events can be quite flawed. Black Hawk Down and We Were Soldiers are exceptions. Movie fiction can be even worse, but there is a place for fiction. Luke Ryan at SOFREP says it well that fiction allows the reader to get inside the character, multiple characters, on both sides of a conflict, and experience the drama and emotions of a fictional occurrence that could happen. To use hard-hitting and direct language to convey the feeling of being terrified or confused. Autobiographies do this well – hard to argue with a first-hand account – but fiction can take that to a higher level, and history is full of compelling stories that resonate with readers long after they’ve finished. “Thank you for your service” rings hollow when the person saying it has no idea, zero, on how our men and women in uniform are deployed and what it is like for their families left behind. Especially today with instant global communications and 24-7 news. Our population is not being taught much of this in school – I assure you – and if they do not have a basic understanding of history and geography then geopolitical life is going to be harder for us as a society. Each of you have a favorite book, fiction or non-fiction, that encapsulates to you a story that every American should know. Give the gift of a book, as many do, to help friends and family understand. Regrettably, Ullman discounted the 30-year “War on Drugs” as not worthy of his study. Those I know who have spent careers “fighting” it quip that our efforts such as they are only serve to prop up the price for traffickers. Books, more than movies, can deep-dive into philosophical questions of warfare and when to wage war, and when not to. In Washington’s where-you-sit-is-where-you-stand political coloring (pretty sure I know where Ullman sits), Ullman does a good job calling them as he sees them, giving it to both parties who have much to be ashamed of. Our country and especially the active-duty military serving it deserves better, much better. It is not too much to ask of our elites in high-level defense, legislative, and diplomatic positions to read works such as his, and other works by well-known authors such as Stavridis and McMaster, to name a few. We should demand it of them. Popular market biographies of such as Powell, Cheney and Rumsfeld are also helpful to educate the public on how DoD functions and the realities of geopolitics, and there are plenty of authentic stories out there. Every American, and there is no excuse if you have a college education, should read at least one true-life account or authentic novel about our military in their lifetimes. That is supporting our troops, and that helps when making an educated vote every-other November. Well said, Kevin! Well said, indeed! Have you shared this on your Facebook page? If not, may I? Might reach a wider audience of those needing to learn of whom you reference in your remarks.